Beau Doesn't Want Some of His Treats Anymore!! 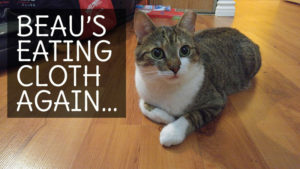 I have an update for you on Beau and his eating habits. 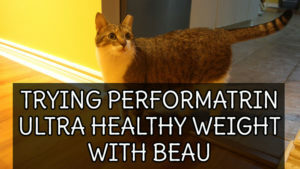 As you can tell from the picture above Beau has gained a bit of weight. This is due to the fact that we have switched his feeding times, how much he gets fed and how he gets fed. Beau is getting fed 1/3 of Performatrin Ultra Lamb & Brown Rice and 1/4 of BLUE Salmon & Potato. Beau also has a series of treats we rotate between. 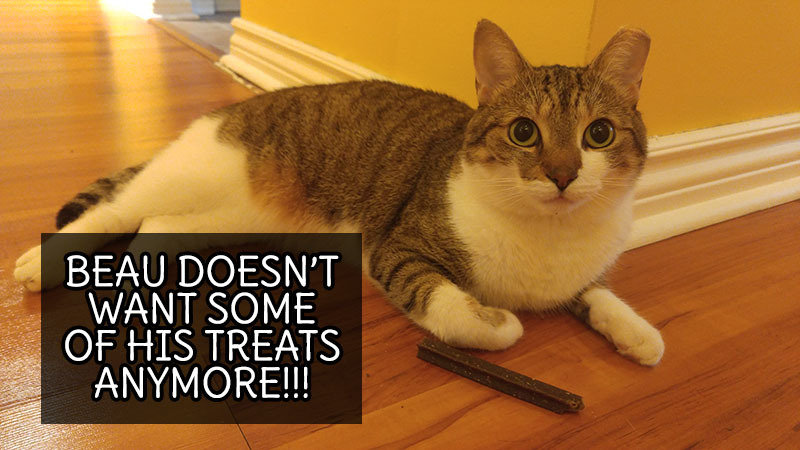 Some include FELINE GREENIES Dental Cat Treats for dental care, Merrick Backcountry Pacific Salmon Recipe Treats for Cats, what’s left of some Purina LUV dental treats and what used to be his favourite Get Naked Grain Free Puppy Health Dental Chew Sticks. Now I know you might be saying: Why would you feed Beau dog treats? Well, after going through the ingredients I found out you can also feed these to your cat. Beau has eaten about 3 sticks (one a week), but more recently he doesn’t seem interested in them anymore. I don’t know why! 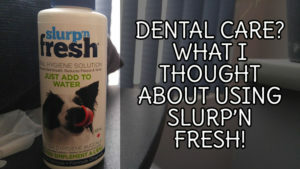 What products do you use to clean your fur baby’s teeth? Has your fur baby ever given up on a treat that he/she used to absolutely love?